Matt Reeves’ latest film, War for the Planet of the Apes, is something of an anomaly. On the surface, it’s a big-budget summer blockbuster. But when you actually watch it, it feels much more like a poignant, bleak movie with Oscar potential. And now, its studio is going to push it as the latter. 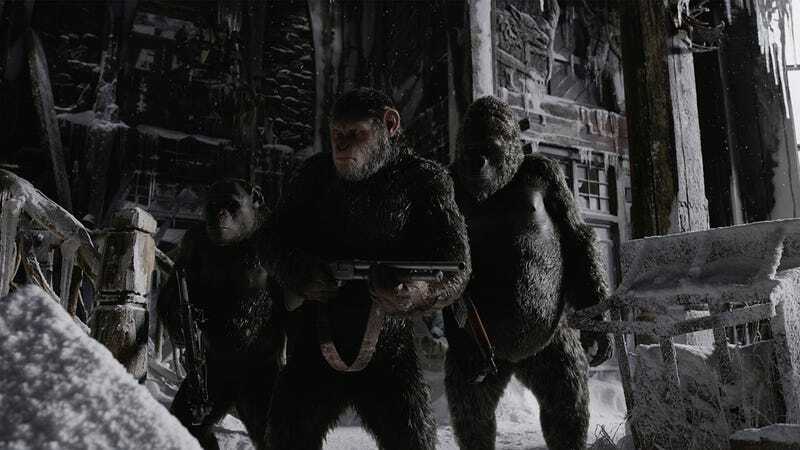 For previous installments in the Apes series, the studio campaigned on behalf of actor Andy Serkis, who plays lead character Caesar. However, he has yet to be nominated, in large part because it’s a performance capture role, a technology that has not yet been embraced by more traditional Oscar voters. This year, though, that’s just one aspect of the plan. Deadline reports the studio has already hired awards consultants to get things rolling, a process that starts with making sure potential voters see the movie. Hopefully, the movie will then speak for itself. But, if not, it’s going to do a full-court press toward all the guilds in several categories—hoping that if War can get tons of technical nominations, a Best Picture nomination will follow. As a huge fan of the film (and a proponent of change in Hollywood), I believe it deserves to be in awards consideration. Not only is it truly a remarkable technical achievement, it’s a damn fine piece of storytelling that focuses on character development to drive the plot. If War for the Planet of the Apes starred humans, there’s no doubt it would be an awards contender. But, because it’s a summer movie that stars animals and features a ton of visual effects, many award voters will pigeonhole it as something it’s not. For Fox to try and combat that is very exciting.